I saw some comments posted in Twitter and Facebook saying that they couldn't get The Smurfs McD toys from Malaysia because it was sold out even before the release date. 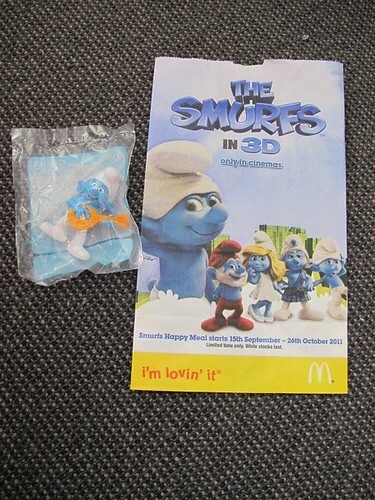 Out of curiosity, I went to McD here in Dunedin to see if they are selling The Smurfs McD toys. I was surprised to see The Smurfs toy is selling in McD here ! I remember I went to McD the last time to see if they were selling Hello Kitty toys because that time Malaysia was hot-selling Hello Kitty but McD here did not sell Hello Kitty. 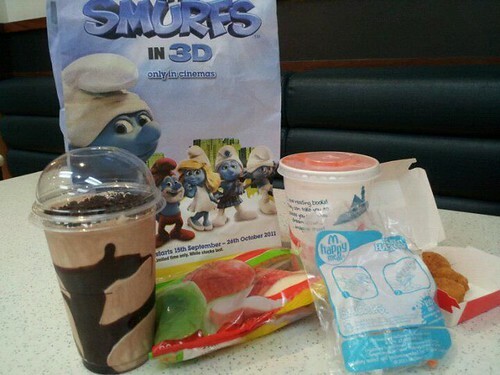 It was just 2 days before the release of first toys of The Smurfs from McD today. 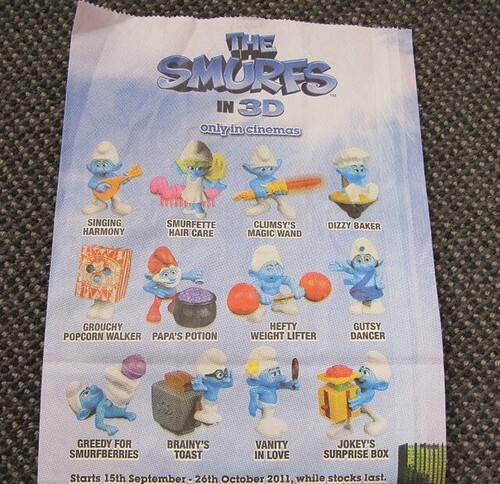 And there are 12 Smurfs toys in 1 set. Compared to Malaysia, there's only 10. The Smurfs are so cute ! I just have to collect em' all ! LOL ! My cousins and friends asked me to help them to collect too. I can't wait for all the other 12 toys ! Although the release date here is slower than Malaysia, at least I don't have to queue to buy :D No one fancy McD toys here LOL. Wow, can't wait to see the whole collection when you're done collecting all (: So mini and cute! Will try to collect all >.< Because some sold out real quick ! hi, can help me to buy?